In Garza’s day, American press coverage of Mexico paid scant attention to the fledgling nation’s internal political dynamics or the views of its population at large. More than a century later, this remains too often true, as the story of Mexico in the U.S. press is mostly a one-dimensional account of the horrible “drug war.” I am no apologist for drug cartels, and I don’t place the revolutionaries of old on equal footing with drug kingpins. Rather, I detect enduring assumptions that govern our coverage of Mexico — what’s perceived as good for the U.S. is portrayed as good for Mexico. To wit, if the U.S. interest is clamping down on the supply of drugs reaching American streets and nightclubs, then calling out the military is a wise policy decision for Mexico. Such a simplistic calculus ignores the fact that narco-trafficking is a firmly entrenched and complex organism that exists for a range of economic, social, and political reasons. The result is that with few exceptions the press has embraced the idea that unleashing tens of thousands of Mexican soldiers on a civilian population as an unquestionably good idea. And in the last three years, the Mexican government has deployed 45,000 troops, made anywhere from 24,000 to 60,000 arrests (depending on the source), and recorded roughly 12,000 dead in this “war.” The U.S. has supplied Mexico with training and military hardware to the tune of roughly $1.2 billion. Credible voices of dissent — both in the U.S. and in Mexico — have been available to journalists. In the U.S., for instance, some in Congress expressed concern about a strategy modeled after the failed approach the U.S. has taken in Colombia. And in Mexico, historians and political commentators raised concerns about increasing the role of the military in civilian life and its effect on Mexico’s young democracy. But with rare exceptions, their views have been relegated to the obligatory “balancing” paragraph or two. For the most part, the horror and gore of drug-cartel violence has seized the press’s attention. By December 2006, turf wars between cartels raged in some Mexican cities. At the time, Felipe Calderon was a new and embattled president with a tiny — .58 percent — margin of victory and protestors screaming “fraud” on the streets of Mexico City. Public-opinion polls reported 69 percent of Mexicans felt “very safe,” and that unemployment and poverty were their top concerns. Still, just days after assuming office, Calderon declared drug violence his top priority and deployed the military in an offensive against the narcos. Now, after three years of this “drug war,” press reports have appeared in the U.S. citing the mounting criticism over human-rights abuses as well as the disenchantment among Mexican political insiders with the government’s tactics. But the dominant storyline — in print and on television — has been to depict the more sensational aspects of the drug violence, focusing on body counts and decapitations and ignoring a number of relevant questions that would have framed the story much differently. For instance, did Calderon launch an internal war to legitimize his presidency? While he was elected in 2006 with the support of the international community, and the church, the elite, and the business class within Mexico, Calderon faced civil unrest in the southern state of Oaxaca and mounting economic problems. A solid half of the Mexican population qualifies as poor, and in the presidential race, a large number of those poor voters supported Calderon’s opponent, Andres Manuel Lopez Obrador. What does victory in this “war” look like, and is it attainable? Is the objective to dismantle the cartels, reduce their size, end the violence, or disrupt drug shipments? Over the last three years, all four have been mentioned by the Mexican and U.S. governments as the goal. Whatever the goal, is a military offensive the best strategy? In the 1970s, the U.S. funded a succession of drug interdiction programs in the coastal state of Sinaloa, where marijuana cultivation was (and remains) robust. 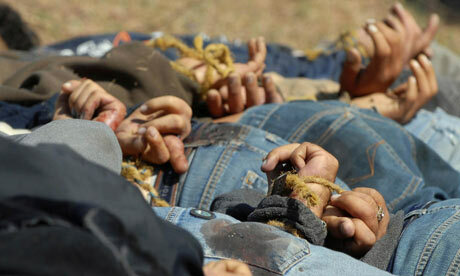 The result: hundreds were arrested and tortured, and the traffickers morphed into today’s cartels. But the strongest reason to question a military-based strategy is the story of the U.S.’s effort to stamp out the cocaine industry in Colombia. Between 2000 and 2008, the U.S. poured some $6 billion into that “drug war.” Yet, according to a report last year by the U.S. Government Accountability Office, coca production increased by 15 percent over the first six years of this decade. While American press reports have consistently suggested that Calderon’s deployment of the military is evidence of his commitment to the drug fight, Jorge Castaneda, a former Mexican foreign minister, noted in a piece in the May 2007 Newsweek International that the secretary of defense in the administration of Calderon’s predecessor, Vicente Fox, had refused to send his troops on the drug mission. “The Mexican military is not trained, equipped or enthusiastic about such chores,” Castaneda wrote. Finally, are Mexico’s public institutions, many of which are notoriously weak and corrupt, prepared for a massive crackdown on drug traffickers? In 2008, for instance, after nearly two years of the “drug war,” Mexico approved a judicial reform package to address the country’s 30 percent conviction rate for alleged narco-traffickers and nearly 5 percent conviction rate in cases of murder and kidnapping. Without an exploration of such questions, we are presented with a simplistic battle between good guys — macho soldiers with loads of ammo — and bad guys — the tattooed and sinister drug goons. Such deeper reporting of Mexico requires a critical perspective on U.S. policy — a perspective that doesn’t fit the simplistic good guy/bad guy paradigm. The drug issue is too often cast as a Mexican menace, with breathless stories of the looming “spillover” of violence along the border reinforcing the notion of the U.S. as a bystander to a Mexican problem. Sam Quinones, a Los Angeles Times reporter assigned to the paper’s “Mexico Under Siege” series, which began in June 2008 and is ongoing, says that without “continual coverage” of Mexico, “what you end up getting is big boom and bash, and you don’t get a lot of subtleties.” Despite the significance of Mexico as a trade partner and a neighbor with whom the U.S. shares a two-thousand-mile border, Quinones finds that among some readers there is “a lack of knowledge that we are part of the war, the drug demand, the guns, the money.” Part of the reason, I would suggest, is articles like a May 31,2009, piece in The New York Times, under the headline “In Heartland Death, Traces of Heroin’s Spread,” which linked the overdose death of an Ohio drug user to the rapacious tentacles of the drug cartels. This perspective reflects the U.S. government’s own war-on-drugs mentality, with its emphasis on punitive policies and on supply rather than demand. When the Times interviewed my great-great-uncle, he introduced himself as a fellow journalist, the publisher of several Spanish-language newspapers. But the interview was conducted in English because Garza understood that the media’s presentation of issues had considerable influence in shaping U.S. attitudes and policy toward its new neighbor. Today, language is less of a barrier to understanding. The problem is a distorted and invisible wall of perception, a wall the press must dismantle to truly see our neighbor — and ourselves. We are shown a simplistic battle between good guys and bad guys. ← Previous Post What is “AA History”? Obama might have lost his partner?